Yesterday was a stormy grey day and we had a ton of errands to run. Jake and I headed out to get his Chinese money exchanged to dollars and buy the things he needed to settle back into living in the US. We got caught in a couple of major downpours and came home soaking wet and freezing cold. After changing into dry clothes Jake needed a nap to help combat jet lag and I started making dinner. 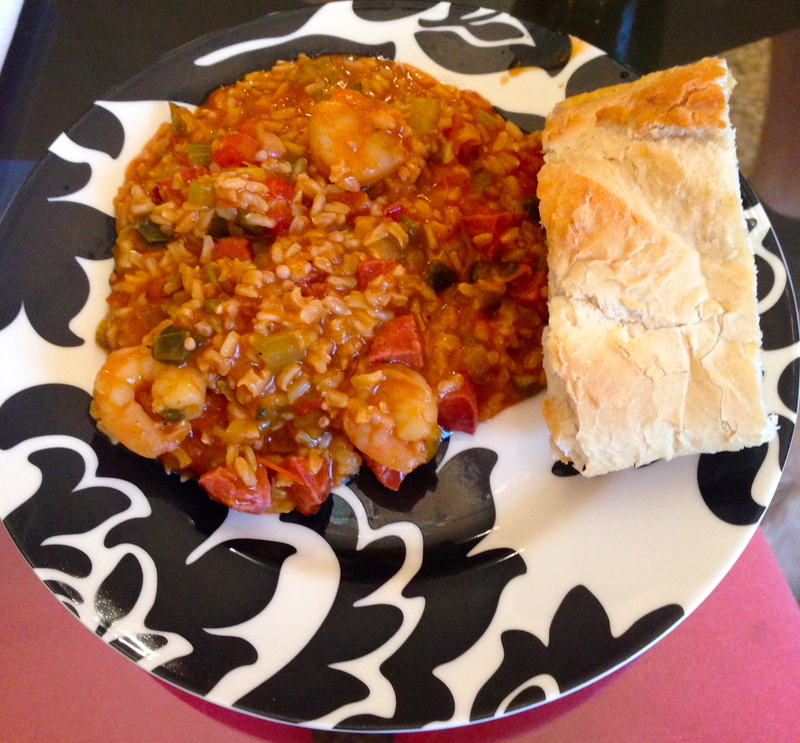 Jambalaya is one of my favorite foods and this recipe is pretty simple. Its perfect with some french bread and a salad with ranch dressing and a sprinkle of cajun seasonings. 1 pound of smoked sausage chopped into bite size pieces. I like Zumos brand, but you can use any kielbasa or smoked link your grocery store has to offer. Cover the bottom of a large pot or dutch oven with olive oil and add the onion, poblano, celery and okra. Turn heat to med-high and stir to coat the oil on the vegetables. Cook until they are tender, but not brown. Stir in the tomatoes, tomato paste and the sausage, then add the rice and broth. Cover and turn heat down to med-low. Let it simmer for about 25-30 minutes, or until the rice is tender. Add in the shrimp, hot sauce and all the seasonings, stir to combine. Once it is heated all the way throughout serve with toasted french bread and a salad. Enjoy!